Orthodontics is the branch of dentistry concerned with the growth of the face, the development of the bite (occlusion) and the prevention and correction of bite problems. In the growing child, orthodontists also aim to harness and modify growth to improve the bite and facial appearance. An Open Bite – i.e. when your upper teeth stay open as your back teeth meet and your tongue is visible between your upper and lower teeth. 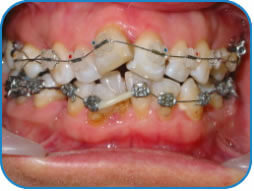 Under Government guidelines introduced in 2006, NHS orthodontic treatment is restricted to children under the age of 18 whose dental health and function is compromised; it is no longer available to those with mild irregularities who would derive only cosmetic benefit. However, all children under 18 are still eligible for a free NHS orthodontic assessment. Before your dentist refers you to the Orthodontist a number of measurements will be taken to distinguish you Need for Treatment, this will then be sent to the Orthodontic Clinic and an assessment appointment will be arranged. During assessment the Orthodontist will decide whether your Treatment Need Index falls into the NHS funding criteria, if not, you will be offered to receive the treatment under a Private Payment Scheme.